Superior quality health care is the very heart and soul of a modern hospital: it is an ongoing process, fundamental to the accreditation recognition and acceptance. Patient-centred care, which means individualised and thorough attention to patient need, each step of the way, from initial consultation, via diagnosis and treatment, to recovery. A culture of patient safety. From the moment you step through our doors, your health and care are our foremost responsibility. Every precaution is taken to minimise the possibility of acquired infection. Disposable syringes, bandages and instruments; round the clock monitoring of your condition; and isolation wards for infectious diseases are just some of our hygienic precautions. Compliance with international standards, procedures and protocols. 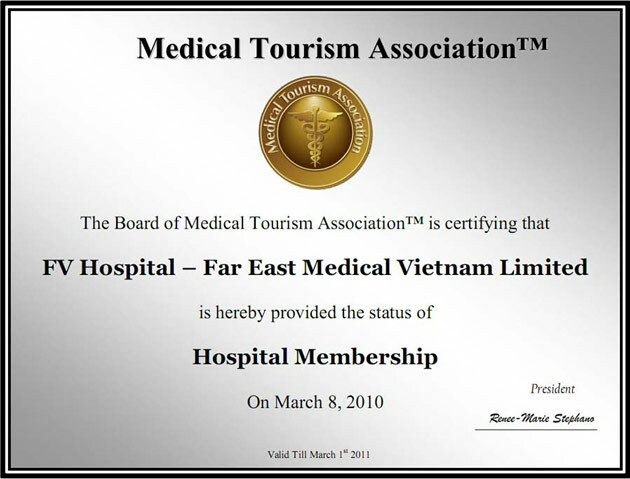 To receive accreditation as a medical facility of international standard, we must conform to the highest accepted levels of excellence, as stipulated by the relevant world health authorities. Every patient is different, each with their own needs, preferences and concerns. To ensure that your individual case is given the unique care it requires and deserves, FVH has a number of indicator measures which continuously monitor every aspect of hospital life. Quality Assurance Department: every item, every action, every medication, and every facility within FVH is monitored around the clock by a dedicated team. Customer Service Department: from the moment you are admitted to FV Hospital, your progress, your needs and your requests will be noted and acted upon by our International Patient Officer. During your stay, she will visit you every day to determine at first-hand your status, comfort and, if any, concerns or requirements. Simply put, by giving strict attention to every detail relating to superior healthcare and by adherence to recognised international healthcare guidelines, as stipulated by the relevant responsible bodies. Patient satisfaction surveys: patients are encouraged to participate in their own healthcare programmes by posing questions to the attending physicians to ensure their full understanding of the proposed procedures and also after each specific treatment. An easy to understand Patient Satisfaction Survey is supplied to each patient, in which every aspect of your time with us is assessed and graded. A similar questionnaire is supplied to out-patients. Staff satisfaction surveys: each attending staff member will also assess and grade the standard of attention and care given to each individual patient, while also noting any comments made by the patient. Mystery caller programmes: from time to time, we even check up on ourselves. This programme involves third party individuals who anonymously call FVH services and then rate the professionalism, information, friendliness and consideration of the various hospital staff contacted. Dry runs (full rehearsals): to provide international standard healthcare services of all levels of complexity, full training sessions are regularly held with the relevant teams enacting every aspect involved in a given situation, from out-patient scenarios to full emergency procedures. Complaint analysis (root cause analysis): if a complaint is received, a governing committee comprising senior hospital staff will evaluate the complaint and get to the core of the problem. Corrective action is then recommended and taken. Incident analysis: should an incident occur, it is important to understand how it happened and what we should do to prevent a similar event.